Since the 6th of October, 1995, several new planets orbiting other suns have been discovered and officially announced. However, in what may be a breakthrough for ufology, on the 20th of September, 1996, a planet was discovered orbiting the star Zeta 2 Reticuli. In 1961, Betty and Barney Hill were abducted by aliens and taken aboard their spacecraft. During her abduction, Betty was shown a star map. She was asked by an alien to point out the Earth, but since Betty had no knowledge of astronomy, she couldn’t reply. After her abduction, and under hypnotic regression Betty Hill drew the star map as accurately as possible. A few years later, Marjorie Fish built a few models of star systems using plastic balls and wire .. one of these models matched Betty Hill’s diagram. The star system from which Betty had been told the aliens originated from was Zeta 2 Reticuli! In 1988, Bob Lazar came forward with an incredible story. Bob Lazar claimed he had worked at Area 51 (S4) in Nevada to reverse engineer alien spacecraft that had been captured by the US Government. During his stay at S4 he was given briefing papers to read and some of them described the alien’s home solar system .. and yes, you’ve guessed it ... Zeta 2 Reticuli, and specifically the 4th planet in that solar system! Now this big quarter of a Jupiter mass planet is in an orbit about Zeta 2 Reticuli which lasts 18.9 days and has a Semi-Major Axis of 0.14 Astronomical Unit (AU). For comparison Mercury has a Semi-Major Axis of 0.387 AU equal to 36 million miles and Earth has a Semi-Major Axis of 1.00 AU equal to 92.9 million miles. Now if we assume that this newly discovered planet, which we will name Zeta 2 Reticulum 1 in accordance with Bob Lazar’s convention, is the closest one to Zeta 2 Reticuli (it’s hard to imagine a closer one), then following Bode’s Law (the law which states each planet is about twice the distance from it’s sun as its inner neighbor) Zeta 2 Reticulum 2 should be at 0.28 AU, Zeta 2 Reticulum 3 should be at 0.56 AU and, INTERESTINGLY, Zeta 2 Reticulum 4 would be at 1.12 AU in between the Earth’s 1.00 AU and Mars’s 1.52 AU, well within the “life-zone” of a G class star! I just found another possible way that this recent discovery could confirm part of Lazar and Jarod 2’s story. I found the length of the Zeta 2 Reticulum 4’s year. How did I do this you might ask? Simple, with calculator in hand I used two elementary laws of Astronomy. Bode’s Law and Kepler’s 3rd Law. The Semi-Major Axis of a planetary orbit is measured in Astronomical Units (AU). The Period of an orbit is measured in Earth days or years. The newly discovered planet has a Semi-Major Axis of 0.14 AU and a Period of 18.9 days. 1 Astronomical Unit (AU) = 92.9 million miles = the distance between the Earth and Sun. The “Semi-Major Axis” is the measurement of the planets orbit, an ellipse, in relation to it’s star in Astronomical Units. The Earth’s Semi-Major axis is 1.00 AU. The “Semi-Major Axis” of a perfectly circular orbit would be the radius of that orbit. The “Period” is the amount of time it takes to complete one orbit. A planet’s period is it’s year. The Earth’s Period is 365.25 days. As I stated before if you apply Bode’s law which states: The semi-major axis of each planet is double that of it’s neighbor nearer to the star. Or simply each planet is about twice as far from its star as its inner neighbor (i.e. Jupiter is 5.2 AU from the Sun, Saturn is 9.5 AU). Now if you apply this to the new discovery of a planet around Zeta 2 Reticuli and you assume this planet is the closest to its star this making it the closest planet to Zeta Reticuli 2 (Zeta 2 Reticulum 1 we will call it in keeping with Lazar’s naming convention, which, I should add differs from the IAU convention which would name it Zeta 2 Reticulum A - so far). At 0.14 AU it’s hard to imagine a closer planet to Zeta 2 Reticuli. For comparison, Mercury is located at 0.387 AU from the Sun so this newly found planet is Zeta 2 Reticulum 1 in all likelihood. Using Bodes law we can extrapolate where the other planets of Zeta 2 Reticuli should be. Kepler’s 3rd law relates the planet’s period or year to it’s Semi-Major Axis of it’s orbit. Mathematically this is expressed as P2 = a3/MStar. “P” is the Period measured in earth years, “a” is the Semi-Major Axis measured in Astronomical units (AU), and “MStar” is the mass of the star measured in Solar Mass units. Using both of these we can find out the length of the year on each hypothetical planet in the Zeta 2 Reticuli System, INCLUDING Zeta 2 Reticulum 4, Bob Lazar’s home of the Greys. So one Zeta 2 Reticulum 4 year is equal to roughly 1.16 earth years OR 422 days. And Zeta 2 Reticulum 4 is in roughly the same position in Zeta 2 Reticuli’s “life-zone” as the Earth is in the Sun’s “life-zone.” Zeta 2 Retituli is a G1V spectral class star, the Sun is a G2V. They are both “G” class main sequence stars, the difference between the “2” and the “1” indicates that Zeta 2 Reticuli is a little hotter than the Sun. The higher the middle number the lower the temperature. The “V” means they are both main sequence (middle age) stars but given Zeta 2 Reticuli’s higher temperature, and lower metallicity, it is probably older than the Sun by a couple billion years. So basically the Sun is a little cooler and younger than Zeta 2 Reticuli. For comparison here is a breakdown of the inner planets of our own solar system. So this brings me to my conclusion. We can check part of Lazar and Jarod 2’s story by asking the simple question: “How long is a year on Zeta 2 Reticulum 4?” If the answer is anywhere in the neighborhood of 410 to 435 days (I’m allowing a lot for error), then their stock will have gone up even more. Keep me posted as to what you find out. Solar-Type, Solar Analog, and Solar Twin Stars are those stars that are particularly similar to the Sun. The classification is a hierarchy with Solar Twin being most like the Sun followed by Solar Analog and then Solar-Type. Observations of these stars are important for understanding better the properties of the Sun in relation to other stars and the habitability of planets. Defining the three categories by their similarity to the Sun reflects the evolution of astronomical observational techniques. Originally, Solar-Type was the closest that similarity to the Sun could be defined. Later, more precise measurement techniques and improved observatories allowed for greater precision of key details like temperature, enabling the creation of a Solar Analog category for stars that were particularly similar to the Sun. Later still, continued improvements in precision allowed for the creation of a Solar Twin category for near-perfect matches. Similarity to the Sun allows for checking derived quantities  like temperature, which is derived from the color index  against the Sun, the only star whose temperature is confidently known. For stars which aren’t similar to the Sun, this cross-checking can't be done. These stars are broadly similar to the Sun. They are Main Sequence stars with a B-V color between 0.48 and 0.80, the Sun having a B-V color of 0.65. Alternatively, a definition based on spectral type can be used, such as F8V through K2V, which would correspond to B-V color of 0.50 to 1.00. This definition fits approximately 10% of stars, so a list of Solar-Type stars would be quite extensive. Solar-Type stars show highly correlated behavior between their rotation rates and their chromospheric activity (e.g. Calcium H & K line emission) and coronal activity (e.g. X-ray emission). As Solar-Type stars spin-down during their Main Sequence lifetimes due to magnetic braking, these correlations allow rough ages to be derived. Mamajek & Hillenbrand (2008) have estimated the ages for the 108 solar-type (F8V – K2V) Main Sequence stars within 16 parsecs of the Sun based on their chromospheric activity (as measured via Calcium H & K emission lines). The following table shows a sample of Solar-Type stars within 50 light years that nearly satisfy the criteria for Solar Analogs, based on current measurements and in order of rising distance. The following table shows a sample of Solar Analogs not meeting the stricter Solar Twin criteria within 50 light years and in order of rising distance. The following are the known stars that come closest to satisfying the criteria for a Solar Twin (the Sun is listed for comparison) in order of rising distance. Some other stars are sometimes mentioned as promising Solar Twin candidates, particularly: Beta Canum Venaticorum, 37 Geminorum, and 16 Cygni B. However, all three have temperatures and/or luminosities that are too high for true Solar Twins. Furthermore, Beta Canum Venaticorum and 37 Geminorum have too low metallicities for Solar Twins. Finally, 16 Cygni B is part of a very wide binary system and is very old for a Solar Twin (at least 7 to 8 Billion Years Old).nbsp; Beta Canum Venaticorum is mentioned above as a nearby Solar Analog. Another way of defining solar twin is as a “habstar” – a star with qualities believed to be particularly hospitable to an Earth-like planet. Qualities considered include variability, mass, age, metallicity, and close companions. The requirement that the star remain on the Main Sequence for at least 3 billion years and sets an upper limit of approximately 1.5 Solar Masses corresponding to a hottest spectral type of F5V. Such stars can reach an absolute magnitude of 2.5, or 8.55 times as bright as the Sun, at the end of the Main Sequence. Non-variability is ideally defined as variability of less than 1%, but 3% is the practical limit due to limits in available data. Variation in irradiance in a star’s habitable zone due to a companion star with an eccentric orbit is also a concern. Terrestrial planets in multiple star systems, those containing three or more stars, are not likely to have stable orbits in the long term. Stable orbits in binary systems take one of two forms: S-Type (satellite or circumstellar) orbits around one of the stars, and P-Type (planetary or circumbinary) orbits around the entire binary pair. Eccentric Jupiters may also disrupt the orbits of planets in habitable zones. Metallicity of at least 40% Solar ([Fe/H] = –0.4) is required for the formation of an Earth-like terrestrial planet. High metallicity strongly correlates to the formation of hot Jupiters, but these are not absolute bars to life, as some gas giants end up orbiting within the habitable zone themselves, and could potentially host Earth-like moons. One example of such a star is HD 70642. There are some minor discrepancies in stellar distances in light-years provided in Wikipedia versus the Zeta Reticuli Incident article. The Zeta Reticuli Incident article was included in the December 1974 issue of Astronomy magazine. The Wikipedia data comes from information derived during the 21st Century. Advances in the equipment used by astronomers, including the Hubble Space Telescope, have made it possible to determine stellar distances more accurately. As of 23 March 2012, 763 Exoplanets (Extra Solar Planets) have been discovered. All of them lie in our Milky Way Galaxy. Exoplanets are defined as those planets that orbit a star other than our own Sun. Based upon the evidence thus far, it appears that planets orbiting stars is the norm rather than the exception. The formation of planets appears to be a part of the evolutionary formation of stars from interstellar gas and dust. An Earth-mass planet has been detected orbiting Alpha Centauri B, the closest star system to our own at 4.37 light-years distant. The Alpha Centauri system, our closest interstellar neighbor and long the stuff of science fiction lore, harbors a planet about the size and mass of the Earth. The planet, known as Alpha Centauri Bb whips around its star, Alpha Centauri B, every 3.2 days and is too close and hot to have any water. But it is both the lightest world to orbit a Sun-like star, and the closest exoplanet ever found to date   by a long shot. The mere existence of this planet suggests that undiscovered worlds may lurk farther away from its star � perhaps in the habitable zone, that just-right range of distances where liquid water can exist. The research team, led by Xavier Dumusque of Geneva Observatory and the University of Porto in Portugal, spotted Alpha Centauri Bb using an instrument called the High Accuracy Radial velocity Planet Searcher, or HARPS. HARPS is part of the European Southern Observatory’s 11.8-foot (3.6 meters) telescope at the La Silla Observatory in Chile. The instrument allows astronomers to pick up the tiny gravitational wobbles an orbiting planet induces in its parent star. In the case of Alpha Centauri Bb, these wobbles are very tiny indeed; the planet causes its star to move back and forth at no more than 1.1 mph (1.8 kph). It took more than 450 HARPS measurements spread out over four years of observing to detect the planet’s signal, Dumusque said. Alpha Centauri is actually a binary system, with Alpha Centauri A and Alpha Centauri B each very close in size to our own Sun. 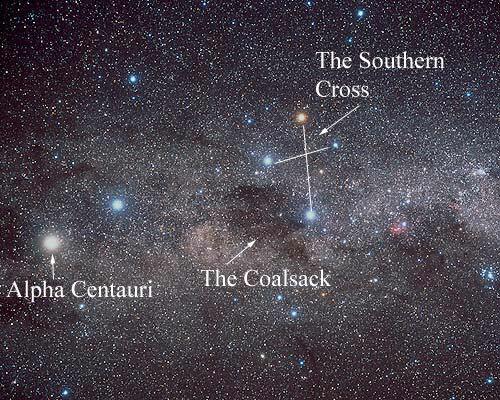 There is a third star, Proxima Centauri, which is associated with this system and named Proxima because it is only 4.22 light-years distant and is about 13,000 Astronomical Units (AUs) from the other two stars. Astronomers at the European Southern Observatory set their sights on the system because it’s likely to harbor planets, and because it would be very tricky to spot a planet there. They did it with a special spectrograph installed on the La Silla Observatory in Chile, and used the so-called wobble method, which measures tiny changes in a star’s radial velocity that are caused by planetary perturbations. It’s an important addition to the exoplanetary pantheon, but let’s be honest   this is amazing because this is Alpha Centauri. It’s so close to us at just 4.37 light-years away, and it figures so prominently in science fiction   that alone makes it an incredible discovery. Alpha Centauri is a special star  not only because it is the closest stellar system to the sun but also because it is one of the relatively few places in the Milky Way Galaxy that may offer terrestrial life conditions. If humanity looks for intelligent life elsewhere, then Alpha Centauri is an excellent candidate. Visible only from latitudes south of about 25° North Latitude, the star we call Alpha Centauri lies 4.37 light-years from the Sun. But it is actually a triple star system. The two brightest components Alpha Centauri A and B form a binary. They orbit each other in a period of 79.9 years with a mean separation of 23.7 Astronomical Units (1 Astronomical Unit = 1 AU = distance between the Sun and Earth). The third member of the system Alpha Centauri C lies 13,000 AU from A and B, or 400 times the distance between the Sun and Neptune. So far it is not known whether Alpha Centauri C is actually gravitationally bound to A and B, or if it will have left the system in some million years. Alpha Centauri C lies measurably closer to us than the other two: It is only 4.22 light-years away, and it is the nearest individual star to the Sun. Because of this proximity, Alpha Centauri C is also called Proxima Centauri. Alpha Centauri A is a yellow star with a spectral type of G2V, exactly the same as the Sun’s. Therefore its temperature and color also match those of the Sun. Alpha Centauri B is an orange star with a spectral type of K1V. Whereas Alpha Centauri A and B are stars very similar to the Sun, Proxima Centauri is a dim red dwarf with a spectral type of M5V  much fainter, cooler, and smaller than the Sun. Proxima is so faint that astronomers did not discover it until 1915. If Proxima Centauri was the distance of 13,000 AU from our Sun, it would have an apparent magnitude of +3.7 or nearly a 4th magnitude star. The dimmest stars that one can see with the unaided eye are +6.0 magnitude - about the apparent magnitude of the planet Uranus. A star with a magnitude +1.0 (a 1st magnitude star) is 100 times brighter than a star of +6.0 magnitude. Magnitude is a logarithmic scale where a change in magnitude of 1.0 units represents a change in brightness of about 2.512 (the fifth root of 100). Age (Billion Years) 4.6 5  6 5  6 1 ? Alpha Centauri is a special place, because it may offer life conditions similar to our Solar System. A star must pass five tests before we can call it a promising place for terrestrial life as we know it. Most stars in the Galaxy would fail. In the case of Alpha Centauri, however, we see that Alpha Centauri A passes all five tests, Alpha Centauri B passes either all but one, and only Proxima Centauri flunks out. The first criterion is to ensure a star’s maturity and stability, which means it has to be on the Main Sequence. Main Sequence stars fuse hydrogen into helium at their cores, generating light and heat. Because hydrogen is so abundant in stars, most of them stay on the Main Sequence a long time, giving life a chance to evolve. The Sun and all three components of Alpha Centauri pass this test. The second test is much tougher, however, we want the star to have the right spectral type, because this determines how much energy a star emits. The hotter stars - those with spectral types O, B, A, and early F - are no good because they burn out fast and die quickly. The cooler stars - those with spectral types M and late K - may not produce enough energy to sustain life, for instance they may not permit the existance of liquid water on their planets. Between the stars that are too hot and those that are too cool, we find the stars that are just right. As our existance proves, yellow G-type stars like the Sun can give rise to life. Late (cool) F stars and early (hot) K stars may be fine too. Luckily, Alpha Centauri A, a G2V star, passes this test with bravour, as it is of the same class as our Sun. Alpha Centauri B is a K1V star, so it is hotter and brighter than most K stars, therefore it may pass this test or it may not - it is marginal. And the red dwarf Proxima Centauri seems to be a hopeless case. For the third test, a system must demonstrate stable conditions. The star’s brightness must not vary so much that the star would alternately freeze and fry any life that does manage to develop around it. But because Alpha Centauri A and Alpha Centauri B form a binary pair there’s a further issue. How much does the light received by the planets of one star vary as the other star revolves around it? During their 79.9 year orbit, the separation between Alpha Centauri A and Alpha Centauri B changes from 11.4 AU (Saturn is 9.537 AU from the Sun) to 36.0 AU (Neptune is 30.06 AU from the Sun). As viewed from the planets of one star, the brightness of the other increases as the stars approach and decreases as the stars recede. Fortunately, the variation is too small to matter, and Alpha Centauri A and Alpha Centauri B pass this test. However, Proxima Centauri fails this test, too. Like many red dwarfs it is a flare star, prone to outbursts that cause its light to double or triple in just a few minutes. The fourth condition concerns the stars’ ages. The Sun is about 4.6 billion years old, so on Earth life had enough time to develop. A star must be old enough to give life a chance to evolve. Remarkably, Alpha Centauri A and B are even older than the Sun, they have an age of 5 to 6 billion years, therefore they pass this test with glamour, too. Proxima, however, may be only a billion years or so old, then it fails this test, too. And the fifth and final test: Do the stars have enough heavy elements - such as Carbon, Nitrogen, Oxygen and Iron - that biological life needs?nbsp; Like most stars, the Sun is primarily Hydrogen and Helium, but 2% of the Sun’s mass is made up of metals (Astronomers call all elements heavier than Helium “metals”). Although 2% may not sound a lot, it is enough to build rocky planets and to give rise to us. And again, fortunately, Alpha Centauri A and Alpha Centauri B pass this test. They are metal-rich stars. Now to the final question. Do we find at Alpha Centauri warm, rocky planets like Earth, full of liquid water? 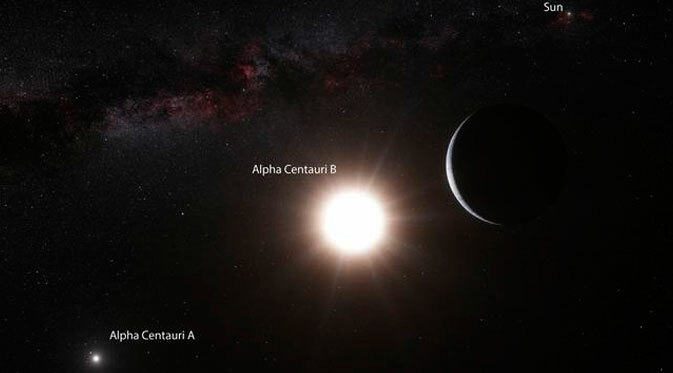 A “terrestrial planet” orbiting Alpha Centauri B has been discovered. Unfortunately, the planet, designated Alpha Centauri Bb, orbits Alpha Centauri B at a distance of 3.6 million miles or 0.039 AU. That is about 1/10 the distance Mecury is from our Sun. 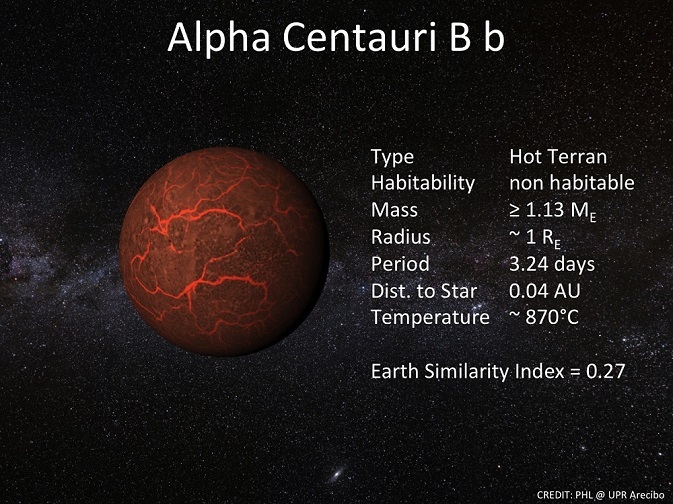 Therefore, Alpha Centauri Bb’s extreme closeness to its parent star probably gives the planet a surface temperature around 2,240°F (1,227°C), making it extremely uninhabitable. At this temperature, the surface, if it’s made of rock, will be liquid rather than solid  like lava. However, most of the low-mass planets are in systems of two, three to six or seven planets, out to the habitable zone. 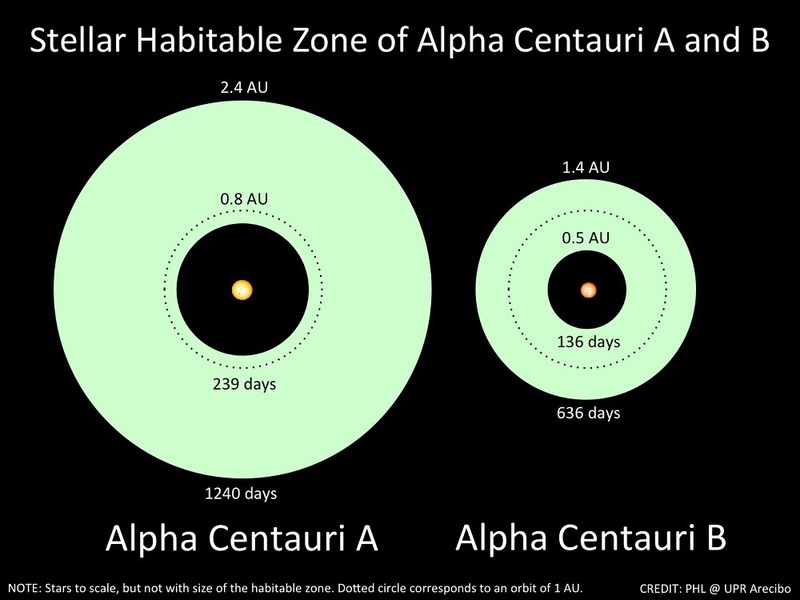 So the discovery provides very good prospects for detecting planets in the habitable zone of Alpha Centauri B. The discovery also indicates that there is a high probability that Alpha Centauri A also has orbiting planets. What we know is that in a binary system the planets must not be too far away from the particular star they orbit. Otherwise, the other star in the binary system could gravitationally affect their orbits resulting in the orbits becoming unstable. If the distance exceeds about one fifth of the closest approach of the two stars then the second member of the binary star fatally disturbes the orbit of the planet. 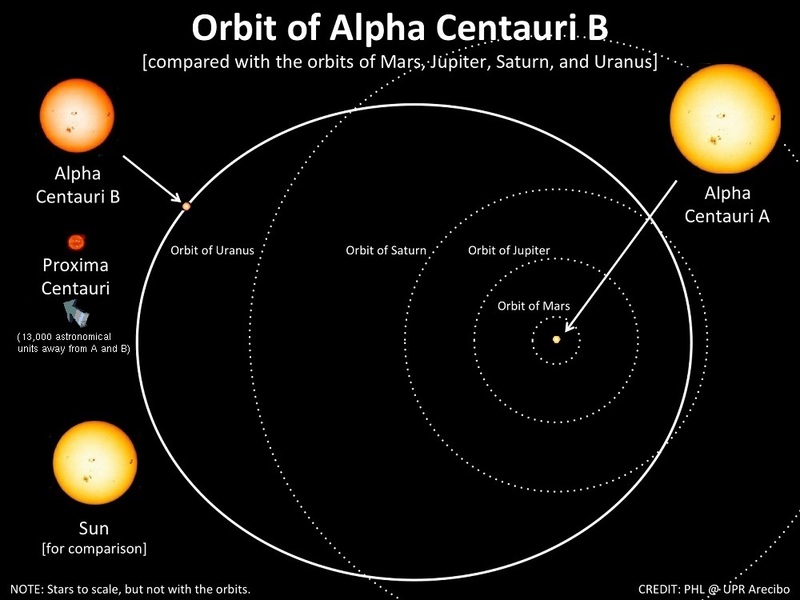 For the binary system Alpha Centauri A and Alpha Centauri B, their closest approach is 11.4 AU, so the limit for stable planetary orbits around each star is at about 2.28 AU. Comparing with our Solar System, we see that both Alpha Centauri A and Alpha Centauri B could support stable orbits of the four inner planets such as what we have in our Solar System:&nbs; Mercury at 0.387 AU from the Sun, Venus at 0.723 AU from the Sun, Earth at 1.000 AU from the Sun, and Mars at 1.524 AU from the Sun. Therefore, both Alpha Centauri A and Alpha Centauri B might have one or two planets in the life zone where liquid water is possible. Old Enough? Yes Yes Yes No? Rich in Metals? Yes Yes Yes ? Do Planets Actually Exist? Yes ? Yes ? Zeta Reticuli (Zeta Ret, ζ Reticuli, ζ Ret) is the Bayer designation for a wide binary star system, Zeta 1 Reticuli and Zeta 2 Reticuli, located in the southern constellation of Reticulum. Zeta 1 Reticuli and Zeta 2 Reticuli are also special stars because they are two of the relatively few places in the Milky Way Galaxy that may offer terrestrial life conditions. We already have evidence that this system supports the existence of intelligent life based upon the abduction of Betty and Barney Hill and from information provided by Bob Lazar when he went public regarding his involvement in reverse engineering an extraterrestrial spacecraft at S4 on Nellis Air Force Base in Nevada. Zeta 1 Reticuli and Zeta 2 Reticuli are only visible from latitudes south of about 25° North Latitude at a distance of 39.5 light-years (12 parsecs) from the Sun. From the southern hemisphere the pair can be seen as a naked eye double star in very dark skies. Zeta 2 Reticuli is orbited by a circumstellar debris disk. Both stars are Solar Analogs that share similar characteristics with the Sun. They belong to the Zeta Herculis Moving Group of stars that share a common origin. 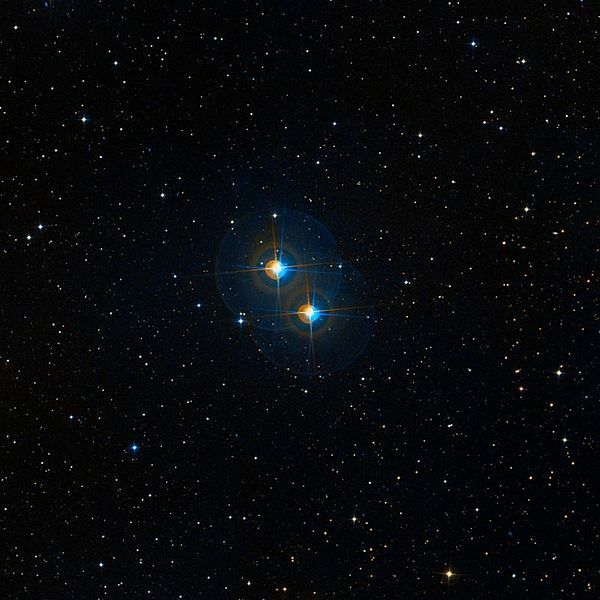 The two stars are located at similar distances from the Sun and share the same motion through space, confirming that they are gravitationally bound and form a wide binary star system. They have an angular separation of 309.2 arc seconds (5.2 arc minutes); far enough apart to appear as a close pair of separate stars to the naked eye under suitable viewing conditions. The distance between the two stars is about 3,750 AU (about 95 times greater than the Sun - Pluto distance), so their orbital period is around 161,000 years. Zeta 1 Reticuli and Zeta 2 Reticuli share similar physical characteristics to the Sun, so they are considered Solar Analogs. Their stellar classification is nearly identical to that of the Sun. Zeta 1 Reticuli has 96% of the Sun’s mass and 84% of the Sun’s radius. Zeta 2 Reticuli is slightly larger and more luminous than Zeta 1 Reticuli, with 99% of the Sun’s mass and 88% of the Sun’s radius. The two stars are somewhat deficient in metals, having only 60% of the proportion of elements other than Hydrogen and Helium as compared to the Sun. For reasons that remain uncertain, they have an anomalously low abundance of Beryllium. Both stars are considered unusual because they have a lower luminosity than is normal for main sequence stars of their age and surface temperature. That is, they lie below the Main Sequence curve on the Hertzsprung-Russell diagram for newly formed stars. Most stars will evolve above this curve as they age. Once thought to be old Population II, galactic-halo-type subdwarf disk stars, Zeta 1 Reticuli and Zeta 2 Reticuli were believed to be as much as 8 billion years old. More recent analysis of chromospheric activity and rotation with spectral analysis and calibration with other Sol-type stars suggest that the two stars may be as young as 1.5 to 3 billion years old. An earlier hypothesis that the stars were relatively dim because of a high abundance of Helium has been refuted recently. The pair is now thought to be part of the Zeta Herculis stellar moving (kinematic) group of high velocity stars as defined by Olin J. Eggen in 1958, which no longer includes Zeta Herculis itself. Zeta 1 Reticuli has an intermediate level of magnetic activity in its chromosphere. The actual age of this system is still in question because of the conflicting information. On September 20, 1996, a tentative discovery of a hot Jupiter around Zeta 2 Reticuli was reported, but the discovery was quickly retracted as the signal was shown to be caused by pulsations of the star. The retraction of the discovery of this planet remains suspicious in light of the fact that Zeta 2 Reticuli was the suspected solar system where the Greys come from. In 2002, Zeta 1 Reticuli was examined at an infrared wavelength of 25 μm, but no indication of an excess of infrared radiation was found. In 2007, the Spitzer Space Telescope was used to find an infrared excess at a wavelength of 70 μm around Zeta 2 Reticuli. This radiation is likely being emitted by a debris disk with a mean temperature of 150°K (-123°C) that is orbiting the host star at a distance of 4.3 AU. In 2010, the Herschel Space Observatory, a telescope with a comparatively superior spatial resolution and, unlike Spitzer, able to resolve radiation excesses beyond the wavelength of 70 μm, determined the infrared excess as coming from a debris disk analogous to the Kuiper belt with a semi-major axis of 100 AU and a temperature of 30°K - 40°K, rather than was previously speculated a debris disk analogous to the Asteroid belt. Whether a debris disc exists around 4.3 AU or 100 AU indicates a significant possibility of the existence of planets orbiting Zeta 2 Reticuli. The Zeta Reticuli system belongs to the Zeta Herculis Moving Group of stars that share a common motion through space, suggesting that they have a common origin. 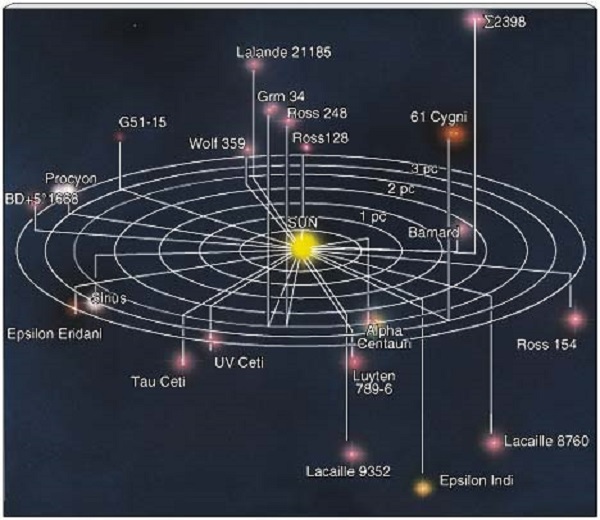 In the galactic coordinate system, the U, V, W components of the space velocity for this system are equal to -70.2, -47.4, +16.4 km/s for Zeta 1 Reticuli and -69.7, -46.4, +16.8 km/s for Zeta 2 Reticuli. The components of space velocity in the Milky Way’s Galactic coordinate system are usually designated U, V, and W, given in kilometers/second (km/s), with U positive in the direction of the Galactic center, V positive in the direction of Galactic Rotation, and W positive in the direction of the North Galactic Pole. The peculiar motion of the Sun with respect to the Local Standard of Rest (LSR) is U = 10.00 + 0.36 km/s, V = 5.23 + 0.62 km/s, and W = 7.17 + 0.38 km/s. Zeta 1 Reticuli and Zeta 2 Reticuli are currently following an orbit through the Milky Way galaxy that has an eccentricity of 0.24. This orbit will carry the system as close as 17.4 kilo light-years (kly) = 5.33 kiloparsecs (kpc) and as far as 28.6 kly = 8.77 kpc from the Galactic Center. The inclination of this orbit will carry the stars as much as 1.3 kly = 0.4 kpc from the plane of the galactic disk. This likely puts them outside the thick disk population of stars which seems to indicate thay may be older stars. In astronomy, the Local Standard of Rest or LSR follows the mean motion of material in the Milky Way in the neighborhood of the Sun. The path of this material is not precisely circular. The Sun follows the Solar Circle (eccentricity e < 0.10) at a speed of about 220 km/s in a clockwise direction when viewed from the Galactic North Pole at a radius of � 8 kpc about the center of the galaxy near Sagittarius A* (Sgr A*), and has only a slight motion, towards the Solar apex, relative to the LSR. The LSR velocity is anywhere from 202 km/s � 241 km/s. Sagittarius A* (pronounced “Sagittarius A-star,” standard abbreviation Sgr A*) is a bright and very compact astronomical radio source at the center of the Milky Way Galaxy, near the border of the constellations Sagittarius and Scorpius. It is part of a larger astronomical feature known as Sagittarius A. Sagittarius A* is believed to be the location of a supermassive black hole, such as those that are now generally accepted to be at the centers of most spiral and elliptical galaxies. Observations of the star S2 in orbit around Sagittarius A* have been used to show the presence of, and produce data about, the Milky Way’s central supermassive black hole, and have led to the conclusion that Sagittarius A* is the site of that black hole. Age (Billion Years) 4.6 1.5 to 3 or 6 to 8 ? 1.5 to 3 or 6 to 8 ? The Zeta Reticuli Star System is also special place, because either Zeta 1 Reticuli or Zeta 2 Reticuli may offer life conditions similar to our Solar System. A star must pass five tests before we can call it a promising place for terrestrial life as we know it. Most stars in the Galaxy would fail. In the case of Zeta 1 Reticuli and Zeta 2 Reticuli, both stars pass all five tests (the age of the two stars is being debated). The first criterion is to ensure a star’s maturity and stability, which means it has to be on the Main Sequence. Main Sequence stars fuse Hydrogen into Helium at their cores, generating light and heat. Because Hydrogen is so abundant in stars, most of them stay on the Main Sequence a long time, giving life a chance to evolve.nbsp; The Sun and both components of the Zeta Reticuli Star System pass this test. The second test is much tougher, however, we want the star to have the right spectral type, because this determines how much energy a star emits. The hotter stars - those with spectral types O, B, A, and early F - are no good because they burn out fast and die quickly. The cooler stars - those with spectral types M and late K - may not produce enough energy to sustain life, for instance they may not permit the existance of liquid water on their planets. Between the stars that are too hot and those that are too cool, we find the stars that are just right. As our existance proves, yellow G-type stars like the Sun can give rise to life. Late (cool) F stars and early (hot) K stars may be fine too. Zeta 1 Reticuli is a G3V to G5V star which is just slightly cooler than our Sun making it very similar. Zeta 2 Reticuli is a G2V star making it nearly identical to our Sun. Therefore, both stars pass this test. For the third test, a system must demonstrate stable conditions. The star’s brightness must not vary so much that the star would alternately freeze and fry any life that does manage to develop around it. But because Zeta 1 Reticuli and Zeta 2 Reticuli form a binary pair there’s a further issue. How much does the light received by the planets of one star vary as the other star revolves around it? During their estimated 161,000 year orbit, the separation between Zeta 1 Reticuli and Zeta 2 Reticula is about 3,750 AU, which is 95 times the distance between the Sun and Pluto. As viewed from the planets of one star, the brightness of the other star would be negligible based upon its significant distance. Therefore, both stars pass this test. The fourth condition concerns the stars’ ages. The Sun is about 4.6 billion years old, so on Earth life had enough time to develop. A star must be old enough to give life a chance to evolve. The actual result of this test is in question because of conflicting information regarding the age of the two stars. The stars are either 1.5 to 3 million years old which would be a test failure or are 6 to 8 million years old which would be a passing test depending upon what data is used to estimate the age of the stars. And the fifth and final test: Do the stars have enough heavy elements - such as Carbon, Nitrogen, Oxygen and Iron - that biological life needs?nbsp; Like most stars, the Sun is primarily Hydrogen and Helium, but 2% of the Sun’s mass is made up of metals (Astronomers call all elements heavier than Helium “metals”). Although 2% may not sound a lot, it is enough to build rocky planets and to give rise to us. For Zeta 1 Reticuli and Zeta 2 Reticuli, this test is somewhat marginal because these stars containe about 60% of the heavy elements found in our Sun – the stars are somewhat metal-deficient. Now to the final question. Do we find at the Zeta Reticuli Star System warm, rocky planets like Earth, full of liquid water? Both Zeta 1 Reticuli and Zeta 2 Reticuli could support stable orbits of the four inner planets such as what we have in our Solar System:&nbs; Mercury at 0.387 AU from the Sun, Venus at 0.723 AU from the Sun, Earth at 1.000 AU from the Sun, and Mars at 1.524 AU from the Sun. Therefore, both Zeta 1 Reticuli and Zeta 2 Reticuli might have one or two planets in the life zone where liquid water is possible. Old Enough? Yes Maybe ? Maybe ? Rich in Metals? Yes Maybe ? Maybe ? Do Planets Actually Exist? Yes Maybe Yes ? Return to either “Government Scientist Goes Public” Web Page, “The Physics of Star Trek and Subspace Communication: Science Fiction or Science Fact?” Web Page, or “The Zeta Reticuli Incident” Web Page.